The art of body piercing has grown to include more and more unique piercing placements and designs. There are now dozens of piercing styles used on the face, chest, back and other parts of the body. Here are a few of the most popular piercing types and how to care for them properly. Facial piercings can be broken down into several different categories. For the purposes of this short explanation, we will discuss eyebrow piercings, nose piercings and other dermal or surface piercings that don’t include the mouth. Eyebrow piercings can be placed vertically or horizontally. Currently one of the most current piercing trends is putting a dermal or surface piercing just below the outer corner of the eye, on the upper cheek bone. Bridge piercings have made a comeback in popularity as well. These are done with a barbell and the piercing goes across the bridge of the nose. There are a few different piercings that can be done on the nose. You can do a stud or hoop in the typical nostril piercing placement, high nostrils, or a septum piercing! For the most part, these piercings can be easily cared for by cleaning them regularly with a non-iodized sea salt and pure glycerin soap. The piercings can be soaked in the sea salt/water solution and the glycerin soap removes and drainage or residues from other products that may have accumulated around the jewelry and at the site of the piercing. You will want to do a strict aftercare routine 2-3 times a day and avoid touching the piercing while it heals. Don’t over-clean it as this will irritate the area and cause the area to swell. Jewelry can typically be changed after a full month or two of healing. a dozen different types of lip piercings. 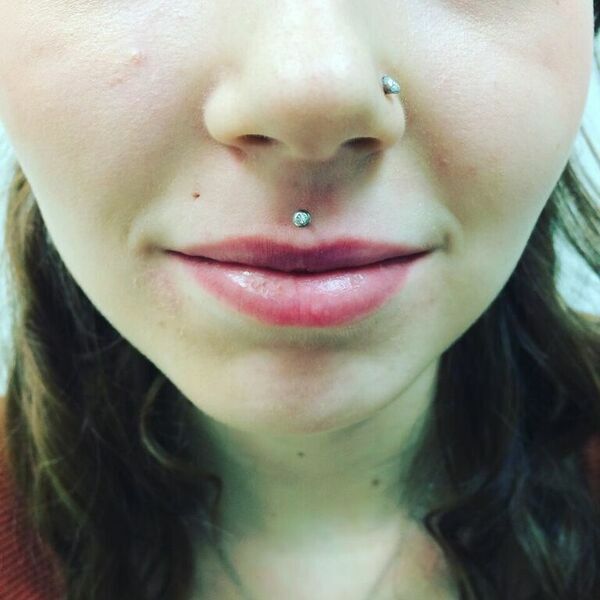 A few options are Monroe and Medusa/Philtrum piercings above the upper lip, cheek piercings, and Lip or Labret piercings on the lower lip. In addition, tongue piercings and oral frenum piercings inside the mouth are common. Caring for these piercings is slightly different than other piercings. Tongue and oral frenum piercings require swishing with mouthwash and sea salt solution. Any type of lip piercings require cleaning routines that include swishing and soaking. Oral piercings tend to heal significantly faster than other areas of the body but also tend to swell more than other areas. For this reason, you are pierced with longer jewelry to accommodate for any swelling that may occur. In general, you should wait 6-8 weeks before changing the jewelry in an oral piercing to ensure it is properly healed. It is also important to note that these piercings will close up much faster than other piercings, so you should not leave your jewelry out for any extended period of time. 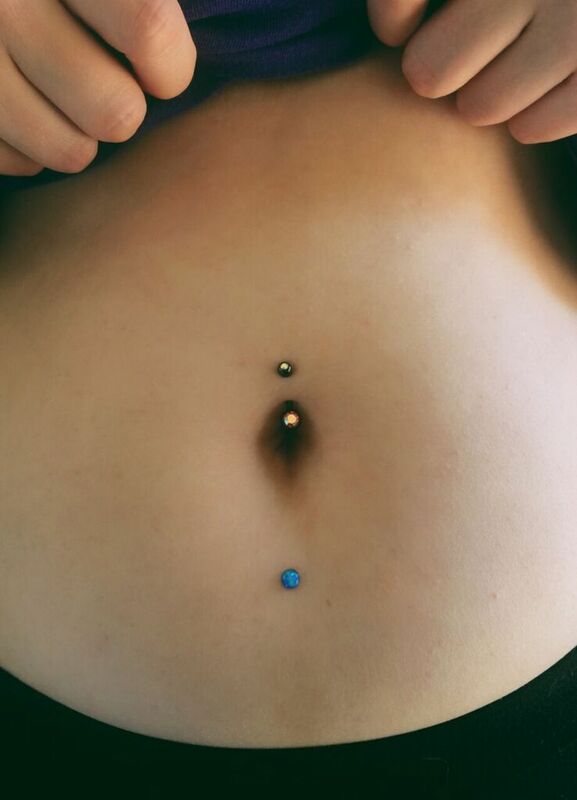 Navel or ‘bellybutton’ piercings have always been one of the most popular body piercings thanks to the wide range of body jewelry available. Most frequently, the barbell portion of the piercing is placed at the upper curve of the bellybutton so that the jewelry dangles down into the bellybutton area. However, some people choose to have the jewelry placed at the bottom of their bellybutton instead. Similar to other piercings, the piercing aftercare requires gentle cleaning with glycerin soap and sea salt. You should be especially careful to ensure that your jewelry does not recede back into the hole. This can happen when the jewelry is too heavy and the area is not properly healed. There are a wide range of other dermal and surface piercing possibilities. 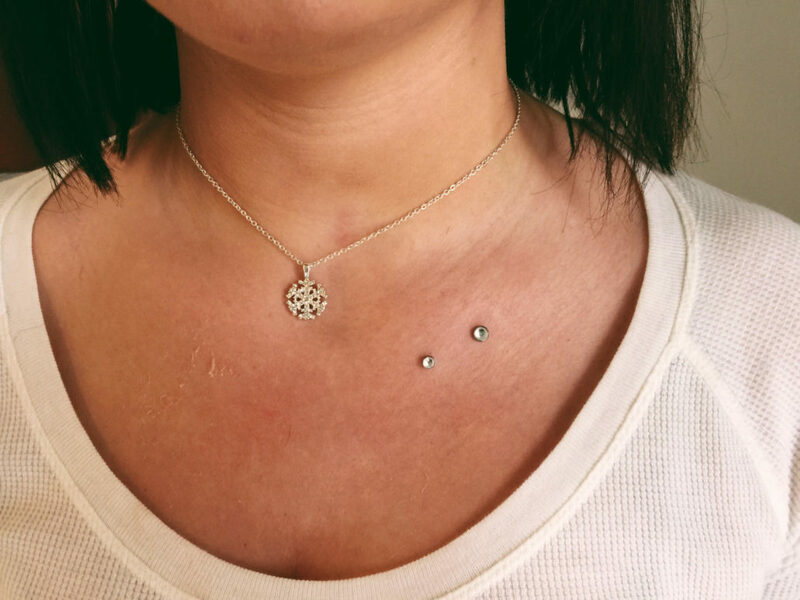 You can read our blog post on ‘Creative Dermal Placements‘ for some inspiration! All of these piercings require basic care and cleaning, and special care should be taken not to snag them on clothing. Genital piercings are a class unto themselves. There are more than a dozen types of genital piercings for both men and women. These piercings are reserved for adults, and require extra special care and cleaning, along with a period of no sexual activity to avoid infections and irritation. Most piercees describe a piercing as being comparable to getting blood drawn. Come in and choose your favorite jewelry style and color from the most extensive body jewelry inventory in the area! Due to differences in State and local regulations, if you are a minor wishing to get pierced, or you are a parent or guardian wishing to bring a minor child in for a piercing, please call the store location you wish to visit for details on what ID is currently required and accepted for both parent and child at that specific location. If you are a guardian, proof of guardianship is required. We reserve the right to refuse service to anyone… We do not perform piercings on people who are or seem to be intoxicated. 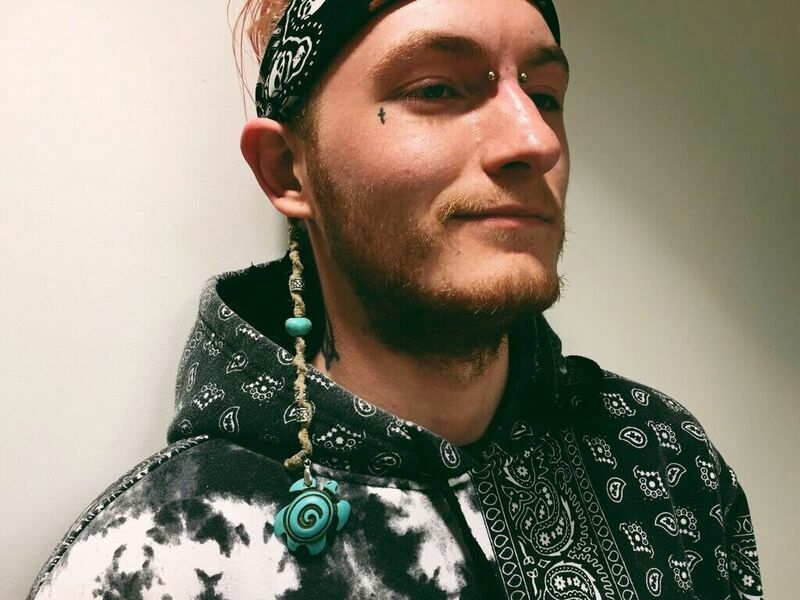 Everyone 18 and older wishing to get pierced must have a valid, state or federally issued picture ID like a drivers license, non-driver picture ID, or a passport. Sorry, no exceptions. All piercings are performed under strict sterile, sanitary conditions by trained piercing professionals. We believe you should be able to express your creativity not only through your new piercing, but with the jewelry you choose to put in it. And no matter what style of piercing you want to have, Almost Famous Body Piercing can help you get the look you want. Piercings are walk-in only. We do not make appointments. For a full list of piercings and up-to-date pricing information, please call or visit the location nearest you. All piercings are per hole unless otherwise specified. Jewelry is extra, and pricing can change without notice. You can also view our online portfolio for some ideas on your next body piercing. We have a huge selection of jewelry options to add color and flare to your body piercing. From simple studs to colored accents, you can make your piercing pop.